Combine garlic and lemon juice in a small bowl and let sit 5 minutes. Whisk yogurt, oil, and sugar in a large bowl; season with salt and pepper. Whisk in garlic mixture. Using a rolling pin, meat mallet, or the flat side of a chef’s knife, lightly whack cucumbers and radishes so they begin to split apart (but not so forcefully that you smash them to smithereens). 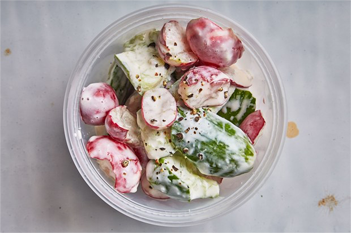 Tear cucumbers and radishes into bite-size pieces with your hands and fold into yogurt mixture. Season salad with more salt and lots and lots of pepper. Transfer salad to an airtight container; cover and chill at least 2 hours. Shake to combine before serving. Transfer drained yogurt to another bowl. Mix in sour cream, lemon juice, dill and garlic. Squeeze out as much excess liquid as possible from cucumber. Stir cucumber into yogurt. Season with pepper. Cover; chill at least 2 hours. (Can be made 1 day ahead. Keep refrigerated.) Preheat oven to 400°F. Place pita wedges on baking sheets. Brush with olive oil. Bake until crisp, about 10 minutes. Cool. (Can be made 1 day ahead. Store pita airtight at room temperature.) 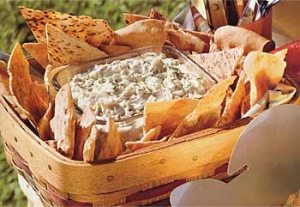 Serve cucumber dip with baked pita wedges.